I received an advanced copy of this book from the author, with no promise of review. A good story of Diana, a Fire Elemental, and Alec, a Vampire, who must catch a dark witch circle that has kidnapped two children. The concept is interesting, and bit different than what I’ve read before. The author does a good job at drawing you into the story. In all the paranormal books I’ve read, I don’t think I’ve ever read an elemental story, so this type of Supernatural is new to me. I find the story reads at a good pace. There’s a couple side plots thrown in. The corporation investigation throws off the tempo a bit, but it gives the book a bit more than just ‘one story’ in a series. It gets a bit wordy at times and I find myself speed-reading through some of it. But then at the end, everything seemed a bit rushed… like the end of a Star Trek episode. The characters are well developed, and they have some depth to them. I do think the author is trying a bit too hard on Diana. I know her character must be established quickly, but it seems pushed to show she’s a badass, and sometimes it reads quirky. And Alec is just a bit too ‘puppy-dogish’ for a 250 year old heir to the most powerful coven. But I do like both characters a lot. I did enjoy this book, and think it’s a great start to the series. I look forward to reading Air, the next book about the Air Elemental, Logan. Read right now for FREE with Amazon Unlimited. Diana, the fire Elemental, is nearly burned out. Tired of traveling the world and losing innocent lives, she's slowly slipping into a depression that may consume her. But when she discovers that a child's life is in danger, she feels compelled to help. However, teaming up with one of the most powerful vampires in North America is the last thing she wants to do. Academic scion, Alec Broussard prefers his studies over the opulent and vicious lifestyles of vampires. And when he learns of another missing child, Alec can't shake the suspicion that his coven may be to blame. Joining forces with an Elemental may be his only hope to save the child and clear his coven's name. As Diana and Alec work together to save the children, they must relinquish their prejudices and trust one another. In time, Alec is wearing down the walls around her. But just when their friendship intensifies, Alec's future is threatened. Now, it's up to Diana to save him before it's too late. 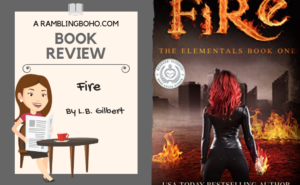 Can this Elemental find the fire within her to protect him once and for all?